Over the years the area has been thoroughly stripped of all historically significant bits and pieces. But guess what we found between the shingles while replacing the roof? This metal plate - about five feet long - originally was probably nailed on a wall somewhere near the theatre. Its recent use was to cover a gap in the roof boards. We would like to find the original architectural drawings of the Sacandaga Station. This would help a great deal in terms of restoring those features of the building that can be made compatible with the present usage plans. Anyone have a clue? If so, please contact us! 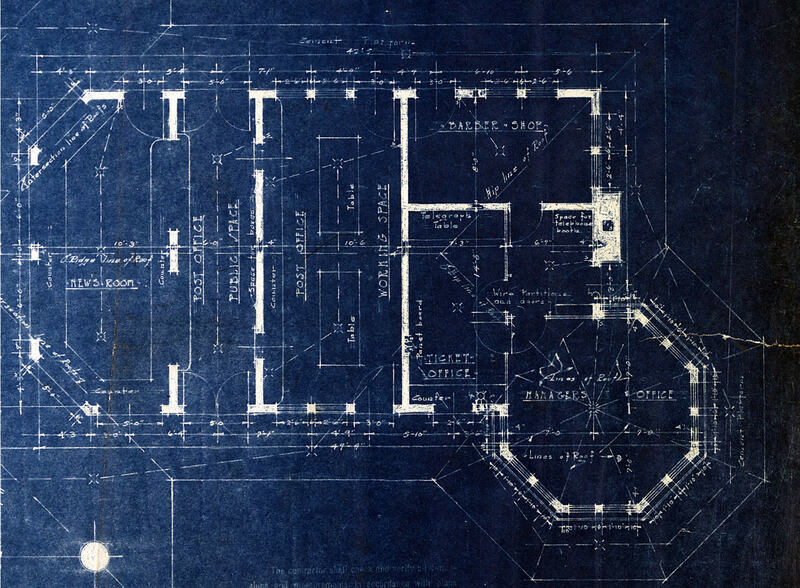 UPDATE - we found the original blue prints in fall 2007! Click HERE for a digital image of the elegant octagonal that was demolished as part of the "renovation" in 1972. 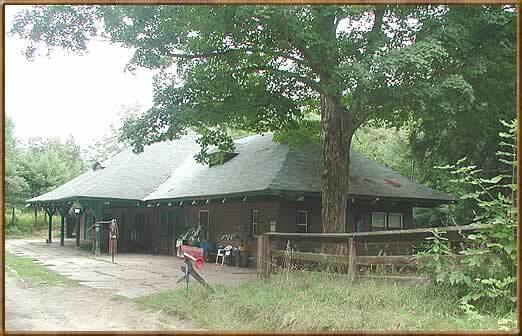 October 27, 2002 There used to be a bell on top of the Station. It was rung at important times, such as the imminent departure of the last train on Sunday. We did find a bell recently that may be the one - maybe not. The inscription is from a school in Berne, NY. The bell was made by the wellknown Meneely Bell Company of Troy, NY in 1884. Anyone have information on this? Click the image to see the bell in action - this requires that Quicktime is installed on your computer. 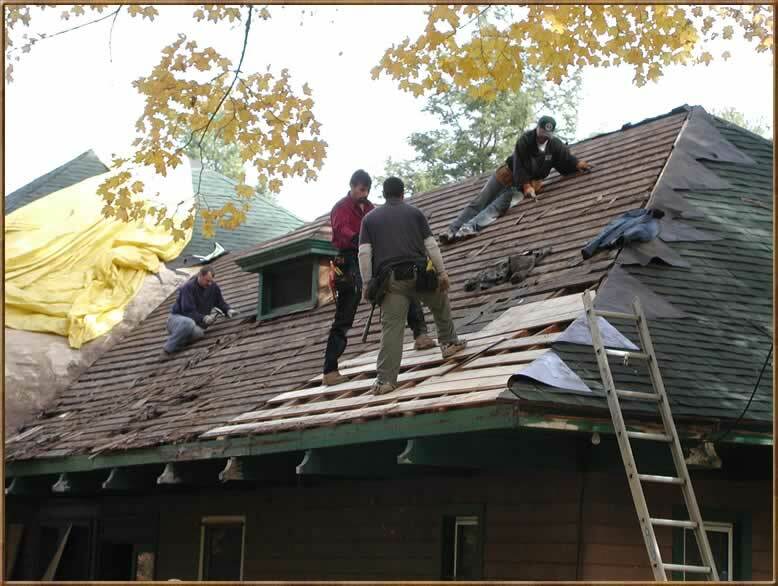 The roofing crew at work. Despite nasty weather for most of the fall, Eckerson Construction finished the job on time. It snowed later that day! December 6, 2002 At today's meeting, the New York State Office for Parks, Recreation and Historic Preservation (OPRHP) has recommended the Sacandaga Station for inclusion on the National Register for Historic Places. December 27, 2002 After the first major snow storm of the season. Recycling the hemlock stable enclosures into floor boards for the Station center section. April 10, 2003 NY State Assemblyman Marc Butler and Town of Northampton Planning Board Chairperson Jim Conklin come for a visit to see the building restoration progress. July 5, 2003 The Annual Meeting of the Sacandaga Park Civic Association is held at the Station so that members can see the building progress and provide input in terms of long term plans and ideas. October, 2003 Picking the exterior color scheme was a challenge - but here it is!